I have to admit, I started Incensed (Soho Crime, 2016) by Ed Lin back in December. But then winter vacation got in the way as did other books I’d committed to review. So when I had a week of vacation in late March, I brought Incensed on my trip and quickly read it in two days. Lin’s story is set mostly in the famous Taipei night market during the Mid-Autumn Festival. That holiday is one of my favorites, and I figured there would be more of the festival in the story, but it ended up not being very central to the story. What I wasn’t expecting and absolutely loved was tension between that native Taiwanese and the mainlanders. For most people, the term “mainlander” conjures up images of wealthy Chinese shoppers from mainland China. But in Taiwan it refers to anyone who settled in Taiwan from mainland China in 1949 or after. So someone’s parent could be born in–say–Shandong in 1947, flee to Taiwan in 1949, grow up there, get married, and raise a family. And he or she would still be considered a mainlander. Lin writes about cultural differences in Taiwan and it’s fascinating. The story revolves around a young, UCLA dropout named Jing-nan, who leaves the US to run his family’s skewer stall in the Taipei night market after both parents die. His uncle is a gangster in central Taiwan and up to no good. One night Uncle Big Eye sends his lackeys to Taipei to bring Jing-nan to him. Big Eye has a sixteen-year-old daughter he wants Jing-nan to look after when she spends a week in Taipei. Mei-ling is an aspiring singer, which is troubling enough to her father. But the real reason he wants Jing-nan to watch over Mei-ling is to keep her away from her ex-boyfriend, a Indonesian who was–god forbid–only 1/4 Chinese. Jing-nan gets in over his head and Mei-ling disappears and all hell seems to break loose with the ganger uncle holding him accountable. The book was less mystery and thriller and more of a gangster and cultural novel, but there were a couple plot twists that kept this reader on her toes. 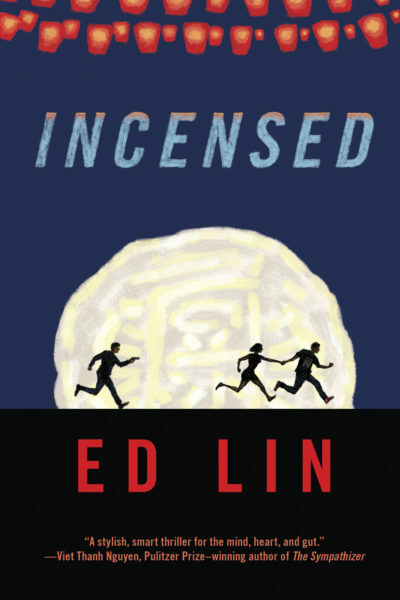 If you’re looking for a quick summer read or something to take on a trip, Incensed is a good choice. I’d give it 4 stars out of 5.